On paper, the 2015 Nissan Juke is just another compact-crossover SUV, with room for five, a 4-cylinder engine and good cargo space. 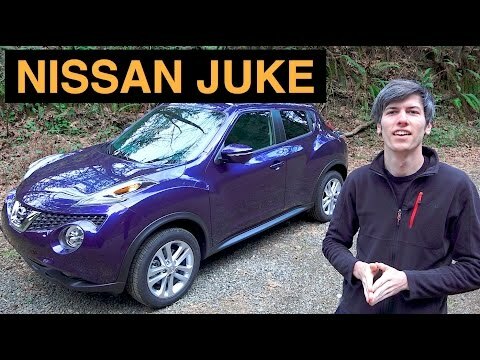 But one look tells you that the Juke is no boring basic transportation. With way-out styling, turbocharged power and even a sporty Nismo model, the Juke's multiple personalities are likely the reason for its success. 2015 black Nissan juke. Kermit the juke. I love my vehicle. My vehicle is a Nissan juke. I named my juke Kermit because it resembles a frog. Kermit is a black frog. It takes approximately $25 to fill Kermit completely up. I hope to keep Kermit for many more years. I purchased Kermit on October 30th, 2015. It had 10 miles on it, and now it has approximately 50, 000. Kermit has been extremely reliable since day one. The only thing I would change about Kermit is its color. I would change Kermit's color from black to mint green. It is a great car that does not feel too large like a truck or van, but not too small like a compact. The entertainment features are great and easy to use. It handles really well, too. The gas mileage is decent, which is helpful with the way gas prices are going. I have had very few problems. My key fob battery died after less than a year but since putting in my own battery it has been fine. That is the only complaint. The Nissan juke is an sporty, fast, small, and interesting car. It accelerates very quickly. It has amazing gas mileage and being able to park in small places while living in a city is nice. I love how the interior of the car is painted with the exterior paint and the trunk is quite spacious. My only dislikes is that the gas tank is so small and there is no arm rest. I also wish I would have opted for the Bluetooth for music as well as phone.